and to CARE as Christ cared. We are a family of all ages, from all backgrounds, and with different reasons for being part of the Church, but God is transforming us all, day by day. 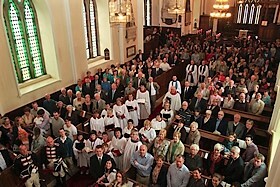 We worship together each Sunday, and up-to-date information on the services can be found here. We believe that living worship leads to active lives, so there are lots of ways to get involved - and we believe everyone has a gift or talent to share! For more information, please phone the office.